Easy Swedish Meatballs are absolutely delicious! 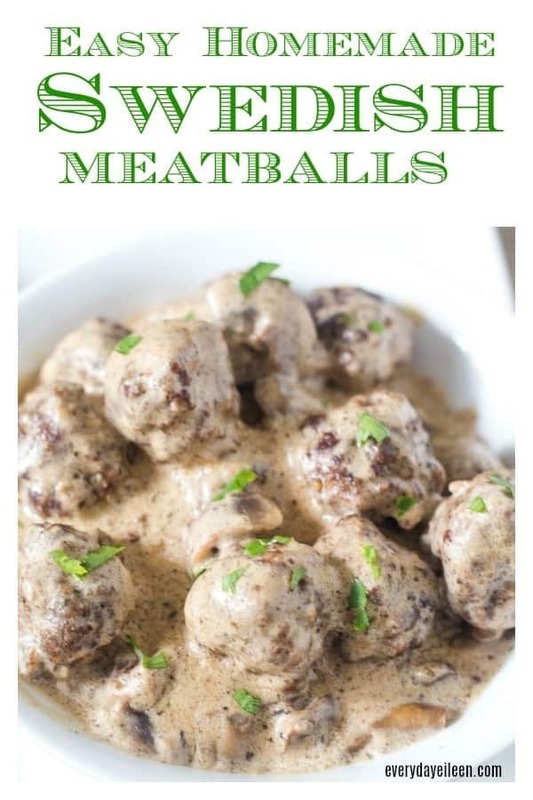 This Homemade Swedish Meatball Recipe is made with homemade meatballs and sauce that will keep them coming back for more! Make a triple batch of easy Swedish Meatballs and freeze some for later! Welcome to Fall everyone! For me, that means getting ready for lots of family and friends coming over for weekend family time and game day fun! Gameday means be ready for hungry people coming ready to eat! I’ve got it covered because I not only love to cook but love to eat too! Game day treats are my favorite! Between the hubs, kids, my niece and parents, that is already a crowd to feed. However, this time of the year, there are always family and friends coming over. I need to be ready for a crowd. We always keep a freezer with food that is easily prepared! One of my families all time favorites is Swedish Meatballs! Oh my, they are delicious! 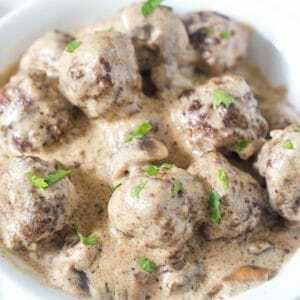 A Swedish Meatball recipe can be made as a main dish or an appetizer. Swedish Meatballs are a great make-ahead recipe. Make an extra batch or two of Swedish Meatballs and freeze for later. What makes Homemade Swedish Meatballs different from other meatball recipes? Swedish meatballs use fresh nutmeg and allspice that go in both the ground meat and the brown sauce. I also brown my Swedish meatballs first and make a gravy type sauce for Swedish meatballs. I rarely brown any other of my meatball recipes! 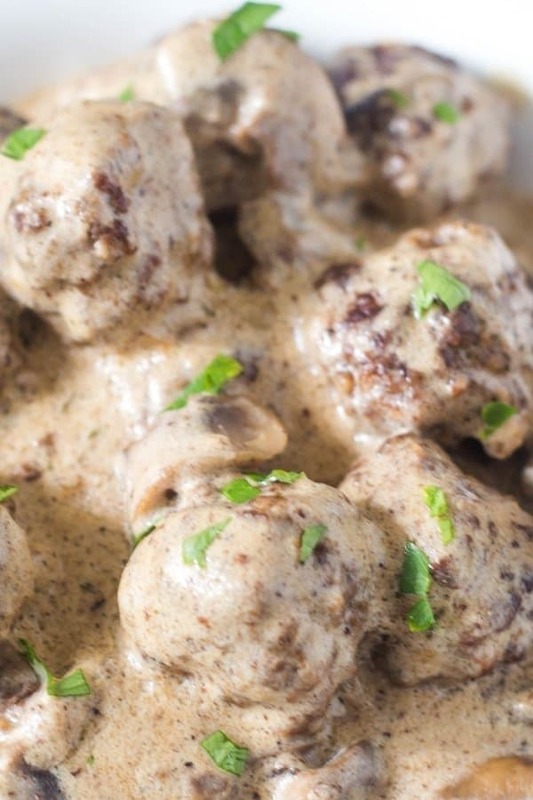 How do you make the gravy for Swedish Meatballs? Swedish Meatballs take 4 minutes to cook. They have beef broth, Worcheshire sauce, Dijon mustard, and thyme added to make a sauce. After the pressure cooker finishes, adding a little heavy cream and cornstarch thickens to a gravy. This takes about 2-3 minutes. Yum, gravy is ready! What do you serve with Homemade Swedish Meatballs? At this time of year, I need to be ready for unexpected company. I also like to plan ahead and not be stressed when I have family and friends coming over. When possible, like to buy ingredients when they are on sale. Food is big on that list! Knowing that I have a hungry crowd watching football all weekend, I am always trying to prep ahead of time. So I buy ahead and meal plan whenever possible! Now here was my big issue my friends, freezer burn! UGH! No matter what I do, something always seems to not freeze correctly. Whether it was these tasty meatballs, marinara sauce, egg muffins! We have all been there. So happy and feeling accomplished to have a meal prep day. Then take out your beautiful creation and there it is ” freezer burn”! Queue sad music because let’s face it, our masterpiece of food is no more! I have got the solution for us all! 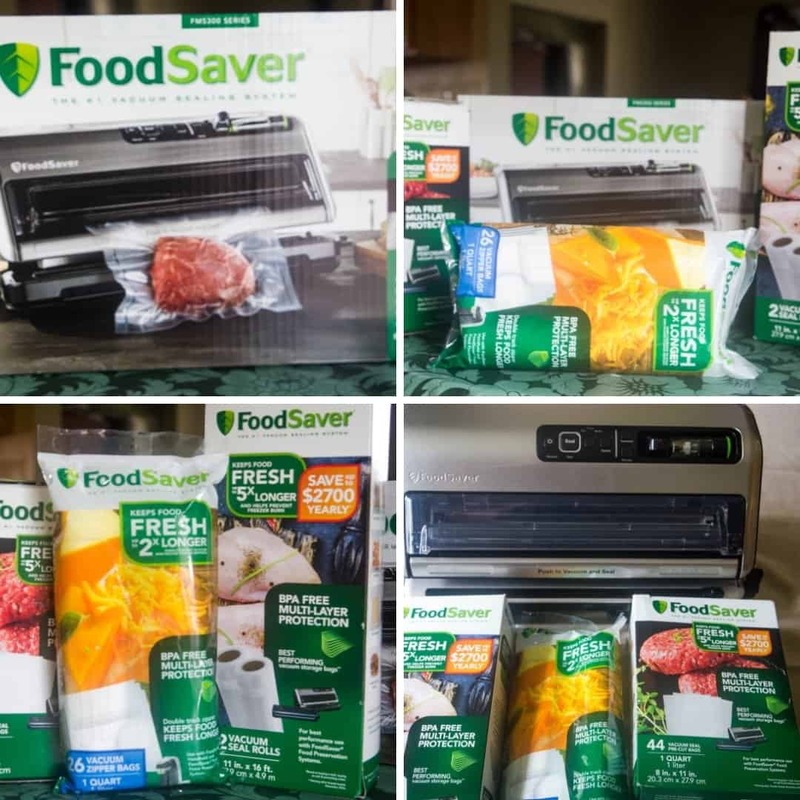 I discovered FoodSaver® FM5330 Vacuum Sealing System! My friends, I just love this product! 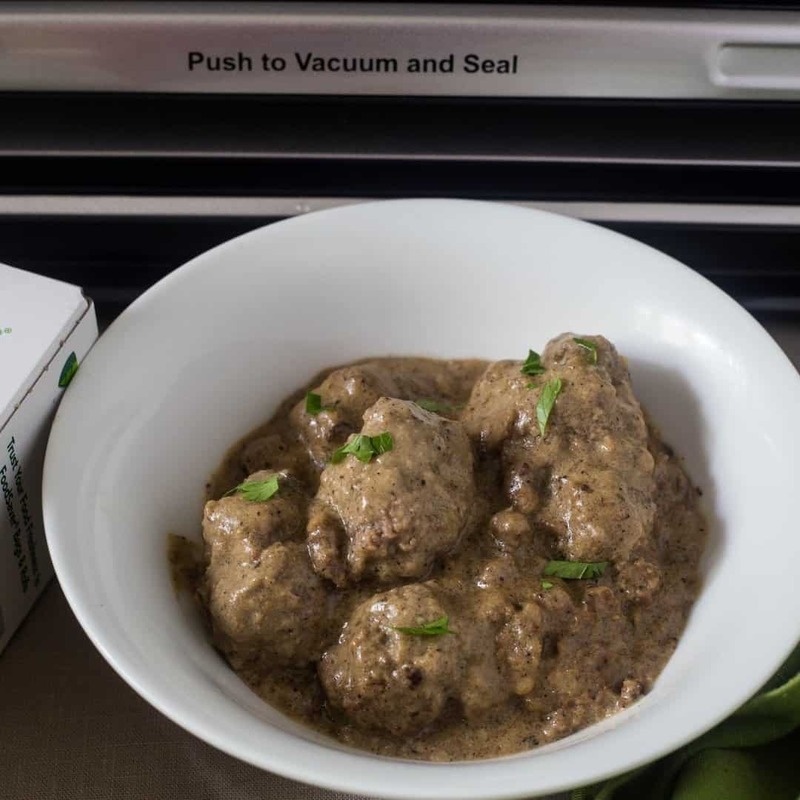 I made a triple batch of my Swedish Meatballs Recipe and I used the FoodSaver® FM5330 Vacuum Sealing System and the FoodSaver® Heat-Sealed Rolls and FoodSaver® Heat-Sealed Bags! Gamechangers!! 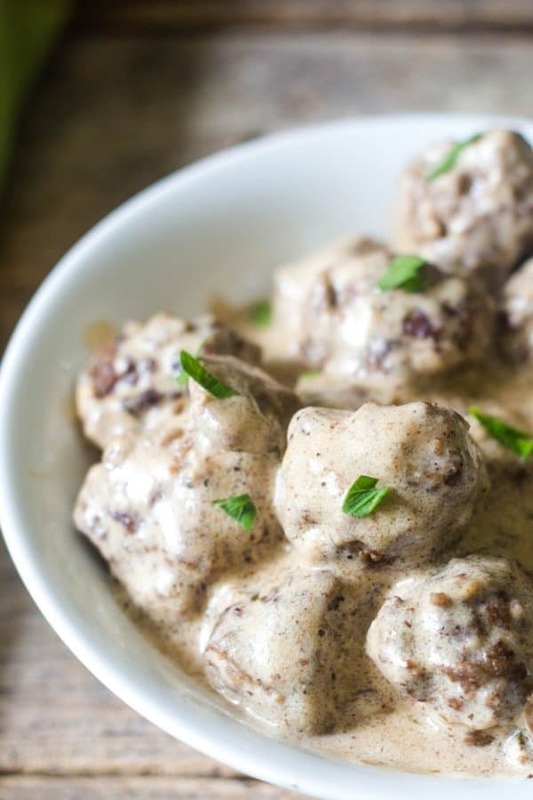 Make ahead meals like these homemade Swedish Meatballs are not a guessing game anymore! I am using the newest model FoodSaver® FM5330, keeps food fresh with fewer steps. The food stays fresh at least 5 times longer than using freezer bags, plastic containers, aluminum foil, etc. Using the FoodSaver® FM5330 saves you money because there is no need to purchase extra wax paper, plastic wrap, and freezer bags for freezing foods. I now meal plan more regularly because I know my food is not getting freezer burn and the food tastes fresh. FoodSaver®System is the number 1 vacuum sealing solution in the US. You may have seen it advertised on TV. The FoodSaver® Heat-Sealed Rolls and FoodSaver® Heat-Sealed Bags are BPA free. 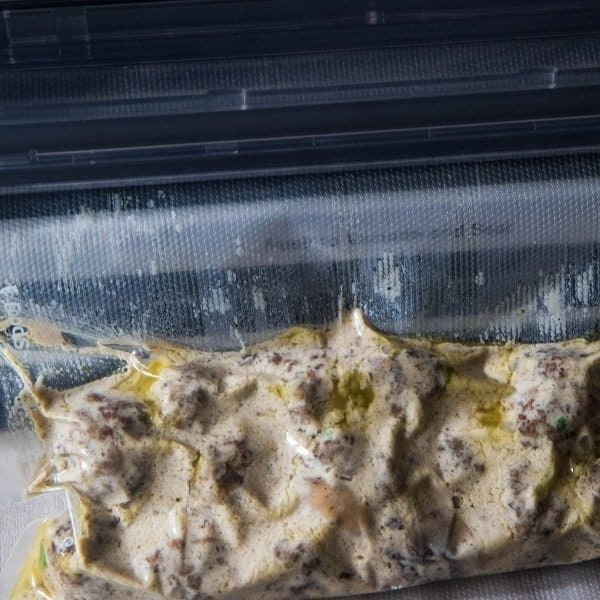 They are great for long-term freezer storage because they block air which prevents freezer burn. Using FoodSaver® FM5330 Vacuum Sealing System and FoodSaver® Heat-Sealed Rolls and FoodSaver® Heat-Sealed Bags. It is easy to install a roll of bags into the FoodSaver® FM5330. Easily pull the bags to the desired length and use slide the bag cutter to cut bag. When ready to vacuum seal a bag in the FoodSaver® FM5330, use both hands to place the bag into the Vacuum View Window. 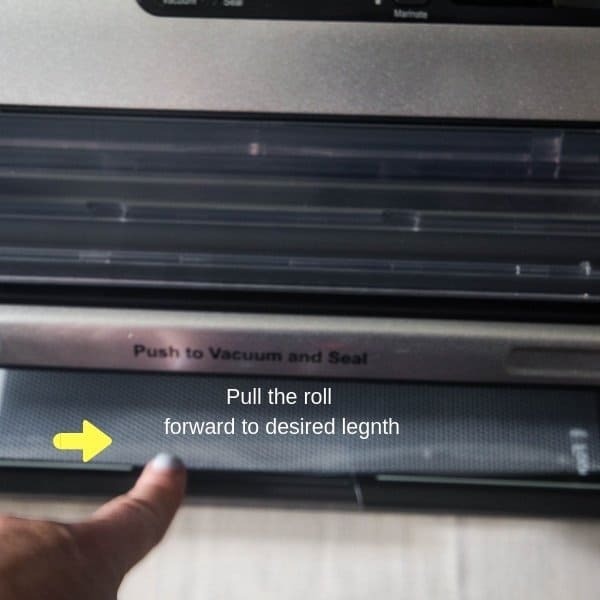 Push the Vacuum and seal button. The FoodSaver® will vacuum the air out and seal the bag. Push the Vacuum and seal button. The FoodSaver® will vacuum the air out and seal the bag. Label the bag with the name of your recipe and date it. 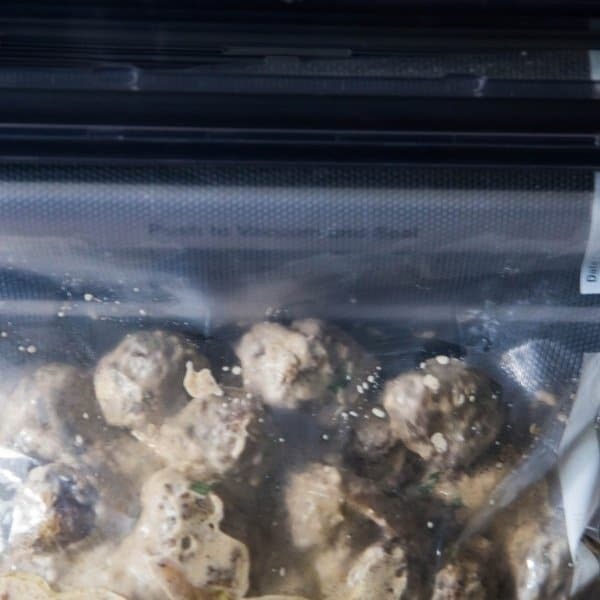 These Swedish Meatballs can be kept in the freezer for 4-6 months. To defrost, either place in the fridge overnight or use a microwave to defrost quickly. These are fully cooked, so they just need to be reheated a few minutes in either the oven, stovetop, or microwave. These are perfect for any family gathering, game day snack, or dinner. I cannot rave enough about how much I love my new FoodSaver® FM5330! My meal-prep is now easy and affordable and the peace of mind knowing the foods I prep and freeze will come out of the FoodSaver® Heat-Sealed Rolls and FoodSaver® Heat-Sealed Bags with no freezer burn. The FoodSaver® FM5330 most definitely is being added to my must-have kitchen items! 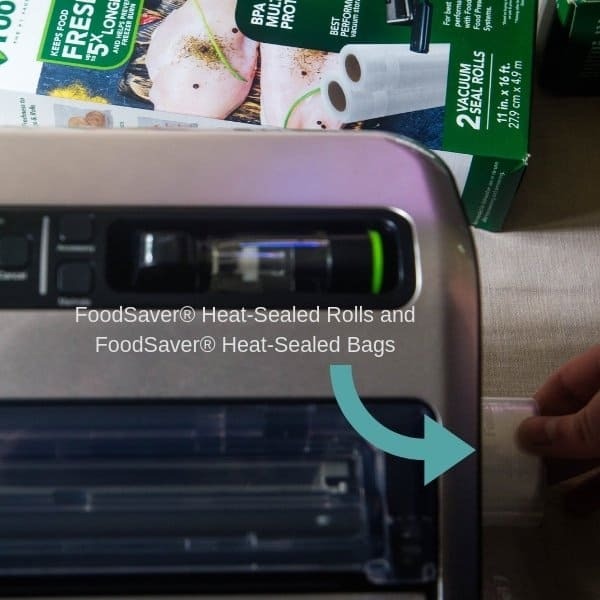 You can purchase both the FoodSaver® FM5330 Vacuum Sealing System andFoodSaver® Heat-Sealed Rolls and FoodSaver® Heat-Sealed Bags at Bed Bath & Beyond! In a large bowl, combine ground beef, bread crumbs, egg, pepper, salt, nutmeg, allspice, Worsheshire Sauce, parsley. Mix to combine. Do not overwork the meat so it remains tender. 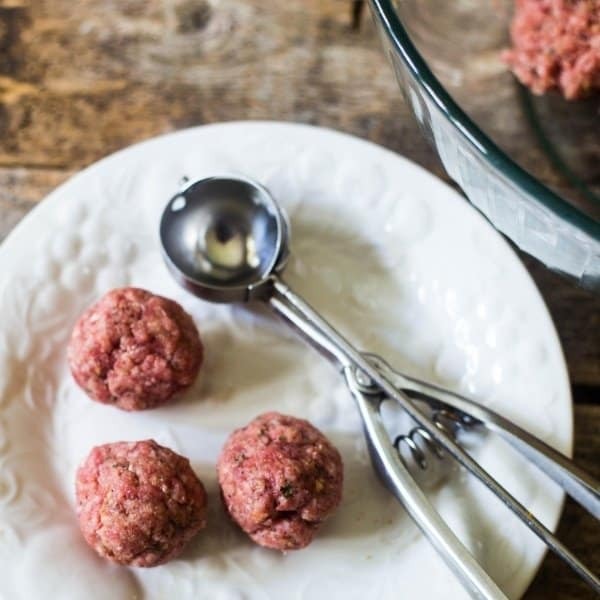 Use a scoop to make 2-inch meatballs. In a large saute pan, over medium heat brown the meatballs. 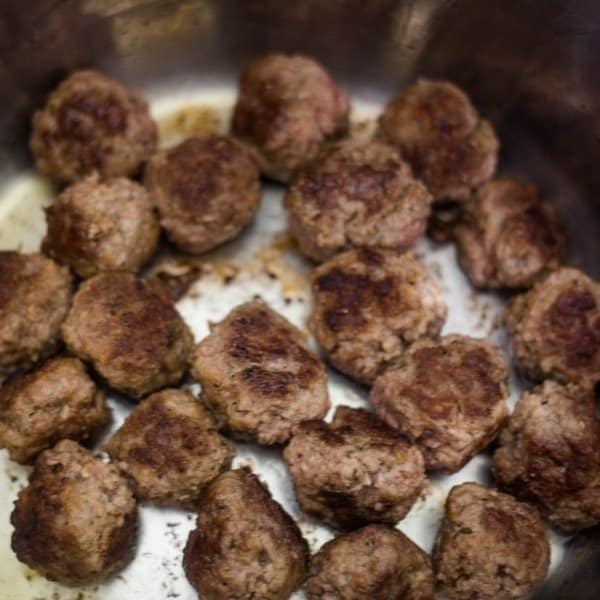 Set aside meatballs after browning. If adding mushrooms, saute them as well. Add in butter and flour, whisk together. Mix in beef broth to the pot to loosen any brown bits on the bottom. Add in Worsheshire Sauce, Dijon mustard, pepper, nutmeg, allspice, and meatballs. Turn heat to low-medium, to simmer meatballs, place the lid on the saucepan and let the meatballs cook through about 25-30 minutes. Stir in heavy cream and let the gravy warm up. Sprinkle fresh parsley on Swedish meatballs. Serve as an appetizer or with your favorite sides. Enjoying Swedish Meatballs, giving it a 5-star rating and any comments are super helpful for me and very much appreciated! Easy Homemade Swedish Meatballs are perfect as an appetizer or a main dish. Served with egg noodles, mashed potatoes, or your favorite side. 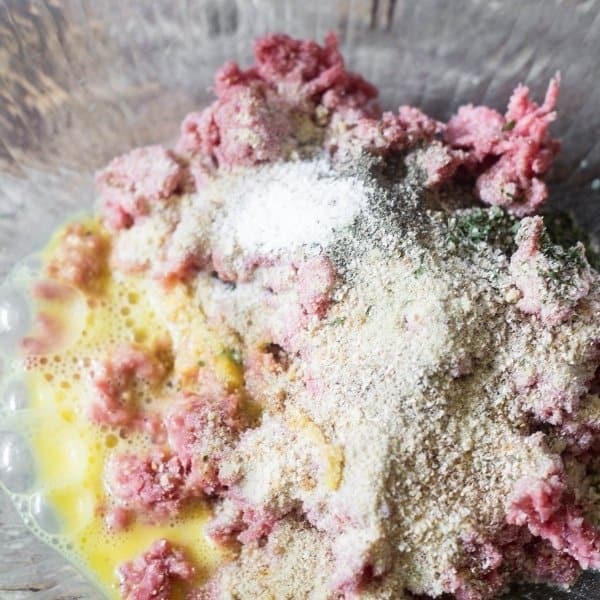 In a large bowl, combine ground beef, plain bread crumbs, egg, pepper, salt, nutmeg, allspice, and Worcestershire Sauce. Mix to combine ingredients. Do not over mix, this keeps the meatballs tender. In a saute pan, add 1 teaspoon olive oil and brown the meatballs. Once all browned set aside meatballs. If adding mushrooms, saute the mushrooms for about 2-3 minutes and set aside. Cover the meatballs and mushrooms with foil. To the skillet, over medium heat add the butter, let melt. Add in the flour and whisk for about 1 minute. Add in some of the beef broth. 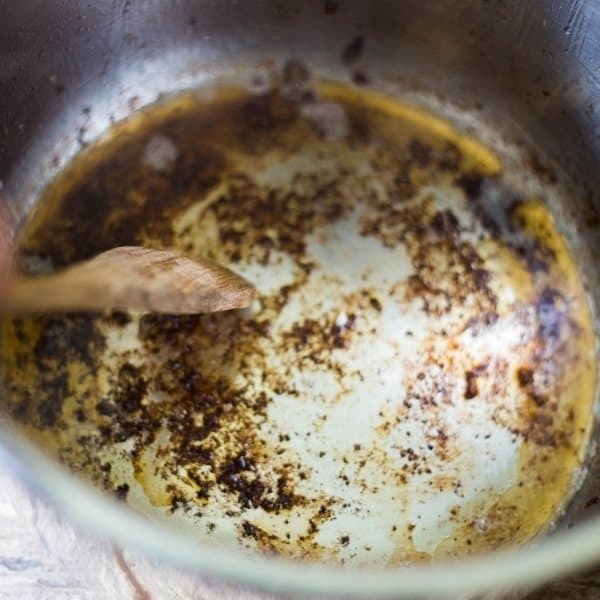 Use a wooden spoon to loosen any brown bits and bottom of the pan. Add in remaining beef broth, Worcestershire Sauce, Dijon mustard, and black pepper. Whisk to smooth gravy. Add back into the saucepan the meatballs and the mushrooms, if you are using them. Let meatballs simmer for about 25 minutes. Gently stir occasionally. Add in the heavy cream, warm gravy. Check the seasoning, reseason if needed. Add in fresh chopped parsley. Serve Swedish Meatballs as an appetizer. As a meal, serve with egg noodles, mashed potatoes, mashed cauliflower, zoodles, your favorite sides. Note 1: I prefer using fresh nutmeg, adds a lot of flavors. If using ground nutmeg us a little more. Note 2: I prefer using fat-free broth. Cuts down on sodium.